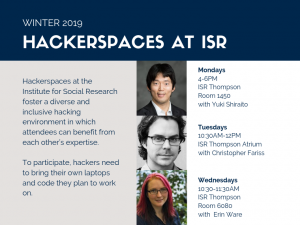 Dr. Shiraito is excited to host a weekly Monday evening hackerspace from January 21 until April 22. On April 22 only, hackers will meet at 2 pm. Dr. Shiraito is available to assist with a variety of topics that include Bayesian statistics, parallel computing in R, OpenMP and Rcpp, web scraping using Python, working with high performance computing clusters (Flux, Beta, Hadoop, Cavium), and other computational methods. He hopes that participants will actively help each other where able. His goal is to create a productive and inclusive community for hackers to share expertise, assist each other in data-intensive projects, and enjoy peer-programming opportunities. Dr. Shiraito looks forward to hacking with you. 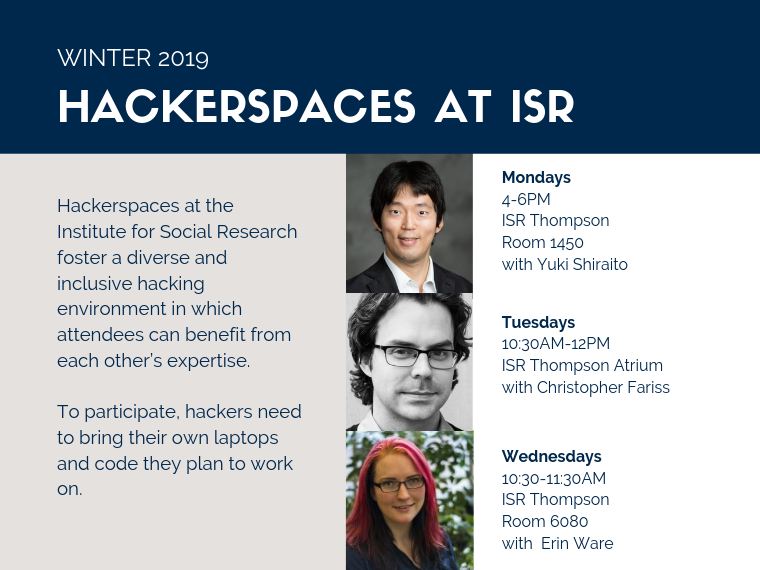 The goal is to foster a diverse and inclusive hacking environment in which attendees can benefit from each other’s expertise. To participate, hackers need to bring their own laptops and, ideally, have a chunk of code they are planning to work on unless they plan to assist and join others in their coding endeavors.